AGA, Protracted Armed Conflict and Humanitarian Action The African Governance Architecture (AGA) has a unique normative framework which bases itself on the standards principles and values enshrined in the instruments of the African Union (AU). This inclusive and cross cutting architecture addresses peace and security, humanitarian action, development, human rights, good governance and gender quality, among others. The ICRC, as an institution which provides humanitarian action, has experience based insight on the nexus between protracted conflicts on humanitarian action in Africa. 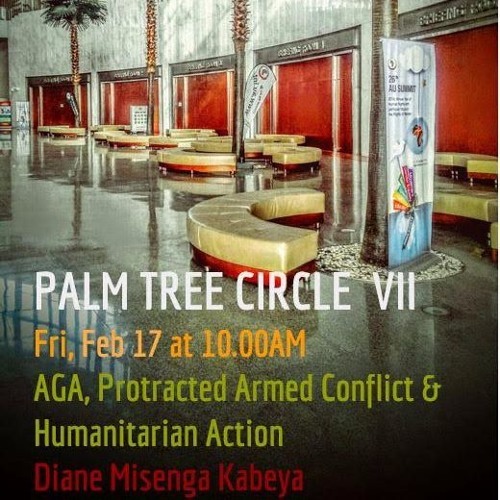 This Palm Tree Circle discussion will examine the aspects of AGA which address both humanitarian action and conflict and use case studies of ICRC experience to discuss the overlap. Our guest facilitator will be Diane Misenga Kabeya who is the Deputy Head of Delegation of the ICRC to the African Union in Addis Ababa. She joined the International Committee of the Red Cross (ICRC) in 2008 and has since worked as a field delegate in West Africa and South America. She has over a decade of experience in human rights and humanitarian work. She started at the United Nations Office of the High Commissioner for Human Rights as Associate Human Rights Officer based in Geneva. Diane specializes in humanitarian law, human rights and peace and security in Africa. She holds a master degree in International and Human Rights law from the University of Montpellier, France.